Were you able to figure out what this ancient skull belonged to? It looks for all the world like a bird, but birds don’t have teeth, do they? Certainly not now, but early in avian history, they did. Teeth are but one of the many pieces of evidence that connects them to theropod dinosaurs like Velociraptor and Deinonychus. This particular bird was named Hesperornis regalis, the “royal western bird”. It lived in the Late Cretaceous, at the same time as such famous dinosaurs as Tyrannosaurus rex and Triceratops and marine reptiles like mosasaurs and elasmosaurs. The picture of the skull above was published by Othniel Marsh in 1880. 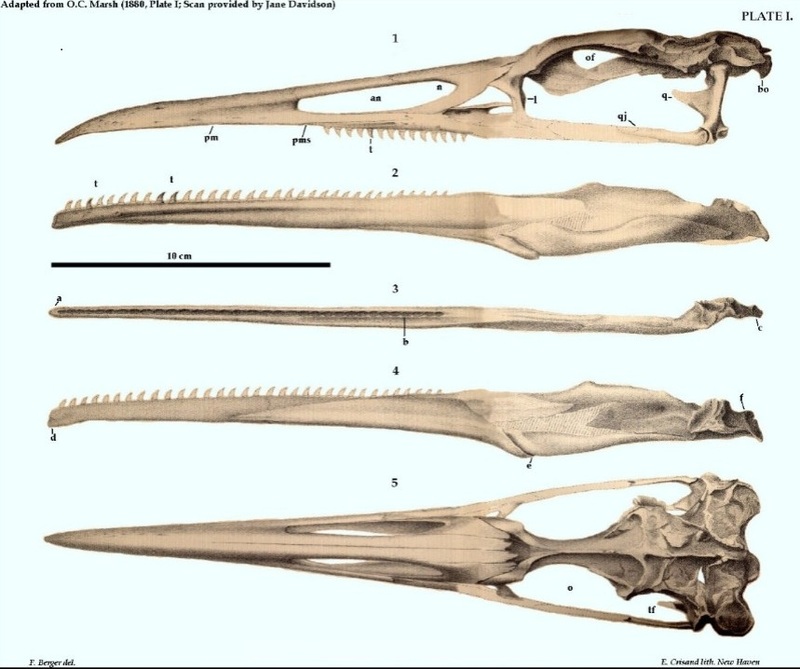 The skeleton Marsh described and several other specimens show that Hesperornis was a diving bird, much like grebes, loons, and some rails and cormorants. Like the flightless cormorant, Hesperornis had very small wings and lacked the ability to fly. Some diving birds, like penguins, use their wings to “fly” through the water, but Hesperornis, like its modern counterparts, used their feet to propel themselves. 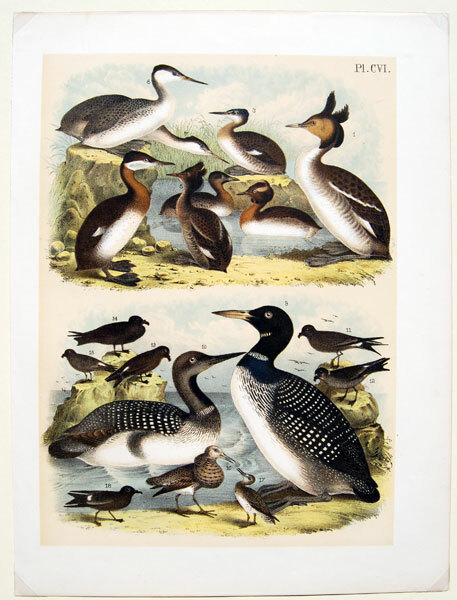 Its feet were likely lobed, like grebes, rather than fully webbed like most aquatic birds. 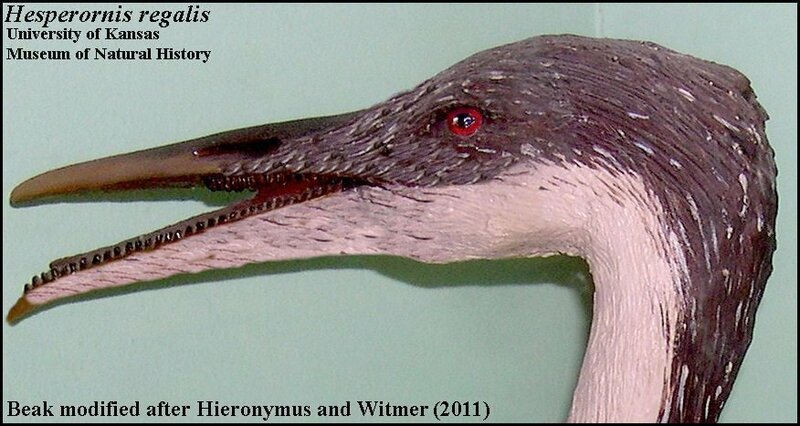 Hesperornis was a large bird, standing close to a meter (3 feet) tall and 1.8 meters (6 feet) in length. Its beak was long and pointed, with teeth on its maxilla and all but the tip of the mandible, or lower jaw. According to work by Tobin Hieronymus, the parts of the jaws with teeth were covered in feathers, with keratin covering the toothless portions. It lived in coastal waters, diving for fish and trying to avoid the aquatic reptiles that were the apex predators of the time. Hesperornis regalis skeleton at the Canadian Fossil Discovery Centre, Morden, MB. Wikipedia. In Arkansas, Hesperornis has been reported from the Ozan Formation in Hempstead County, a series of mostly sandy, limey mudstone, typical of warm coastal marine areas. 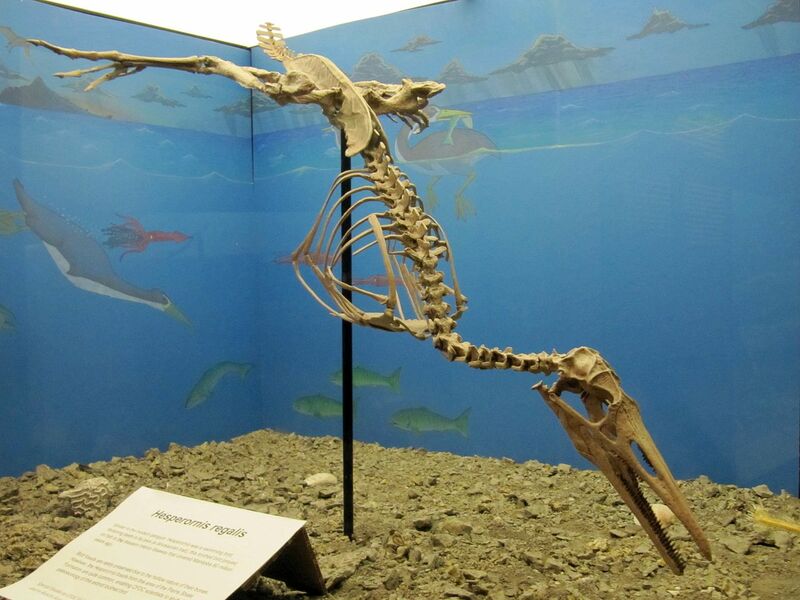 As one would expect, given Hesperornis‘s aquatic nature, all the other fossils found with it represent marine animals, including sharks, bony fish, turtles, mosasaurs, and pliosaurs. During the Late Cretaceous, when these sediments were deposited, southwest Arkansas was at the eastern edge of the Western Interior Seaway, a marine environment created by high sea levels that flooded much of the central United States. This find represents the southernmost extent of Hesperornis’s range, which extended up into the Arctic. It was a lot warmer then, but still cold at the poles. It should be kept in mind though, that the find consists of one partial bone, the left tarsometatarsus, part of the lower leg. It is easily recognizable as avian and has been identified as Hesperornis due to its age and size, although Dr. Larry Martin stated it could be a new taxon. We will just have to wait until more fossls turn up to know for sure. Parts of the Ozan Formation are quite fossiliferous, so there is a chance that more will be found. By paleoaerie in Fossils of Arkansas, Paleontology on December 5, 2014 .